Here is a look at the card I designed for The Stamp Simply Ribbon Store. 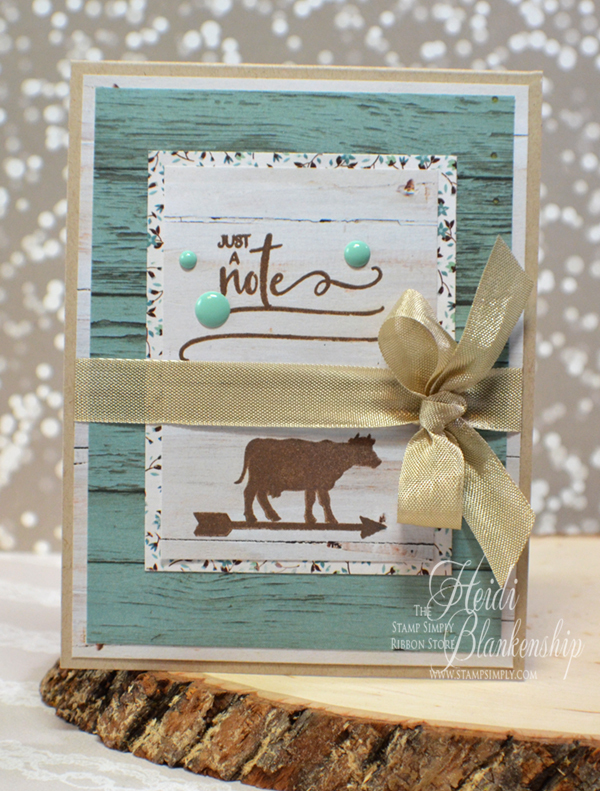 I used one of the newer Stamp Simply Clear Stamps - Farmhouse Signage. I am really loving all of the farmhouse decor I am seeing in the stores these days. It's very simplistic, fresh, pretty, rustic and sometimes a little industrial. I'm really leaning to redo our kitchen in the farmhouse style when the time comes to start working on it. The pattern papers I used are from the Kaisercraft - Sea Breeze collection. I love the aqua blue tones in the paper pad! I layered three different patterns of paper and I even did the stamping on the pattern paper. 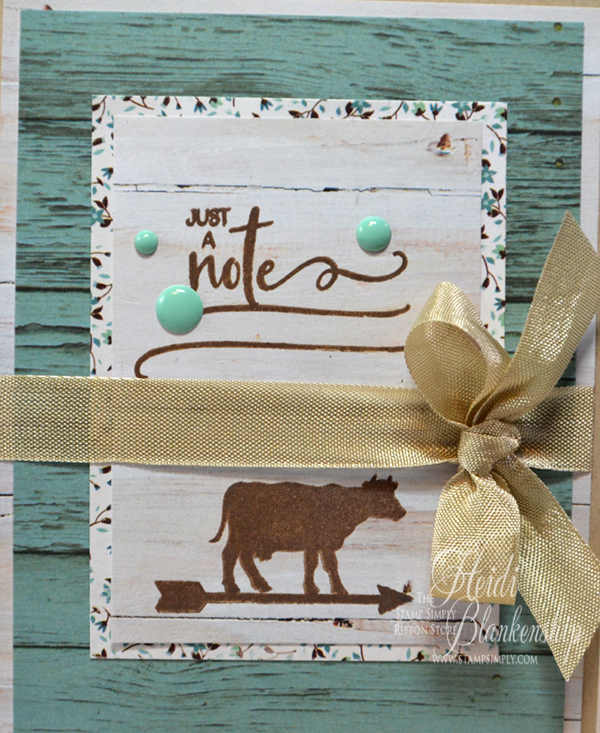 For the stamping I used Tim Holtz Distress Oxide Ink - Walnut Stain. 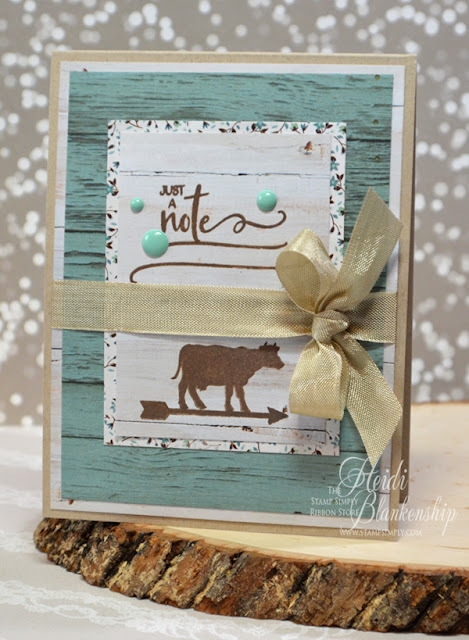 The oxide inks are so great for stamping especially with clear stamps. I actually used a total of four stamps to create the images and sentiment. I used the Tm Holtz Stamp Platform to line up all of the images for perfect placement. Then I added some Seam Binding Fig Beige and tied a simple bow. To finish off the card I added a few Simple Stories - I Am Enamel Dots. I created an A2 top folding card base with a piece of kraft cardstock. I hope you enjoyed today's card share! This would be a great card to make multiples of and you could change out the animal images. It's such a quick and easy card to create. All of the supplies are listed and linked below and can be found at The Stamp Simply Ribbon Store. If you would like to see more card inspiration I encourage you to check out the Stamp Simply Blog. Thanks so much for stopping by today! I hope you have a wonderful weekend! We are supposed to be getting even more snow!! I can't believe it! Wondering if Spring will ever come lol.